not to please an algorithm. the more you pull towards your side, the less you will accomplish. Both want to eat off the bushes that are on each side of the road, but the rope isn't long enough. Both donkeys pull hardly hoping to drag the other to their side. They pull and pull, but none move an inch. The animals become very frustrated - no one could reach its bush. So, they stop and try to figure out how to eat. "What if we work together? ", both donkeys say simultaneously. The animals decide to take turns. They would move together towards one bush and eat from it. They could then move to the other side and eat from another bush. When you think in absolutes, the only 'bush' that matters is the one that you can see. You can't acknowledge other sides - even if the other party is trying to accomplish the same goal. when you believe you possess the truth, your subjective beliefs blind you from seeing other options. is the silent perception of reality." Can you really be objective? Or is objectivity a social construct? In his book Contemplative Science, B. Alan Wallace suggests reconnecting contemplation and science. The Latin term 'contemplatio,' from which 'contemplation' is derived, corresponds to the Greek word 'theoria.' Both refer to total devotion to pursuing the truth, and nothing less. Science wants to own objectivity - to understand the nature of reality. By trying to remove all subjectivity, modern science divorced itself from both religion and philosophy. "man's greatest inhumanity to man" as Wallace explains. Our society became more knowledgeable, but not more wiser or compassionate. Dogmas, however, are hard to validate. They are defined by a higher authority - God, a leader, a group practice or an extraordinary experience. The difficulty to scientifically study that are beyond the physical world. That's why dogmas are placed beyond challenge. Absolute Objectivity is like having God's eye view. "The view from nowhere," as Thomas Nagel described it. Those who claim to be absolutely objective pretend to see things from 'nowhere', like God does. For every absolute, there's an opposite absolute. Each positive absolute has an opposite negative one. And the other way around. 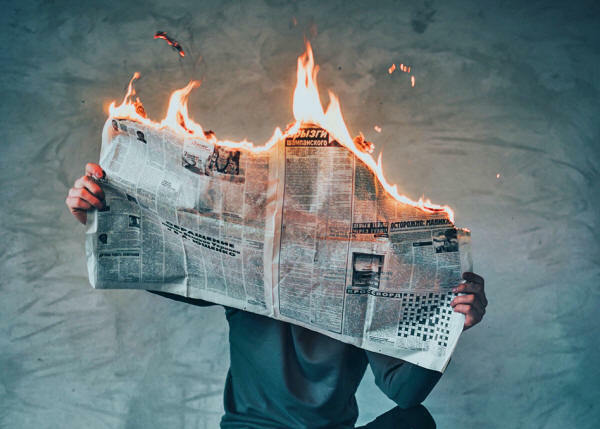 Moral Absolutism establishes that there are absolute standards against which moral questions can be judged - certain actions are either right or wrong. It is the opposite of Moral Relativism, the idea that there is no universal set of moral principles - they are culturally defined. Those who worship "absolute objectivity" have a hard time integrating opposite perspectives. For them, you either support absolute objectivity or you are a 'relativist' - someone who thinks no belief is better than any other. Dogmatism disables objectivity of judgment because it suppresses alternatives. One person's extreme is someone else's moderation. Opposites need to integrate rather than fight each other. Just like the donkeys, they have to work together instead of trying to drag each other to their own side. To solve for the tension between absolute dogmas, you have to untie the donkeys. Absolute objectivity is beyond human experience. Realizing you don't possess God's eye view, helps you embrace a more humble approach to being objective. You might not let your emotions cloud your judgment as much as other people do. However, you are still human. Rather than force yourself (and others) to choose sides, find the middle way. The 'Middle Way' is not a happy medium - it's not the average of two truths. a space between the extremes of sensual indulgence and self-mortification. It's about seeking balance - to reconcile and transcend the duality that characterizes most thinking. The Middle Way is a path that embraces both spiritualism and materialism - just like the back and front sides of a paper. The Middle Way Society defines it as a principle that can help us make better judgments. We understand conditions in the world or in ourselves better by relying on experience, but our learning from experience is often blocked by fixed beliefs. When the donkeys stopped trying to pull each other, they could reframe the situation. They were able to consider other alternatives and started working together. By being receptive to new possibilities, the donkeys achieved their goals - they moved from conflict to integration. identify root causes and seek means of resolution. It could be expressed as the commitment to upholding respect for the dignity of life. The opposite to dogmatism is skepticism. Rather than taking one truth as absolute, you challenge all the truths. Skepticism is not being negative or rejecting every possible truth. It's about having a critical mind and not letting your beliefs get you stuck in one truth. Perception is ambiguous and dynamic - we impose our own stories to what we see. How can you tell if what you experience is absolutely real or tinted by your own subjectivity? Even the most rational scientists and philosophers have biases. They might be more aware than ordinary people but are not immune to being human. It's understanding that knowledge is built every time a theory is debunked by a new one. That's how science has always evolved. When you believe one theory to be absolute and perfect, you don't leave room to incremental improvement. Skepticism is not thinking that beliefs are wrong, but that they may be wrong. If anything were absolute, there wouldn't be room for improvement or innovation. 'Provisionality' is the capacity to change our beliefs in response to new experiences or new reasonings. One thing is changing your mind because you want to or to please others. Another thing is to update your ideas as part of your learning journey. Avoid dogma. Use critical awareness to understand the flaws in your beliefs. It's accepting that some of your truths may be false. Understand and challenge your own beliefs rather than consider them absolute. Be receptive to criticism. Optionality is having different ways of thinking and behaviors available. 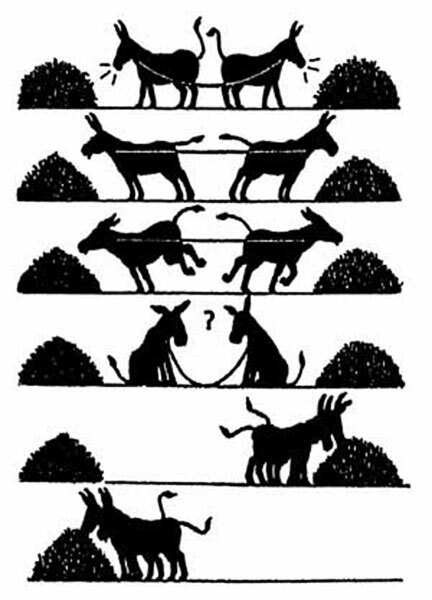 Rather than pulling the other donkey to your side, you collaborate with it. Don't let other people's beliefs overpower you. Keep your own judgment. We are social animals; it's hard not to be influenced by others. Things are fluid, they rapidly mutate. One event might look positive today and then, an unexpected twist, could turn it into negative. Provisionality requires adopting a 'maybe mindset,' as I explained here. Don't try to turn your personal preferences into something objective. Accept other people's subjectivity. Your food or music tastes are different to other people's choices. Yours are not right or wrong; they are just yours. Religion is a perfect example of tensions driven by dogmas. Religion is about the dignity of life, to realize our purpose as human beings. Focus on the commonalities. What's the purpose behind your religious beliefs? Accept that, even though others have a different creed, they can share the same goal. Dogmas push us to think of options as mutually exclusive. A 'Yes, and...' approach is about building on other people's ideas and not seeing them as opposite or exclusive. Creativity benefits from an abundance mentality - a 'Yes, and...' mindset removes being judgmental and encourages diversity of thinking as I explained here. That doesn't mean thinking that everything is wrong but rather that it may be wrong. Ask "why?" When you get an answer, ask why again. Repeat over and over, as kids do. The two donkeys represent the negative and positive absolutes. Embrace a 'provisional' mindset. Realize that the truth - no matter how objective - evolves through time. Nowadays, no one questions that the Earth revolves around the sun. However, in the 17th Century, Galileo Galilei almost got killed for being the first to state that. Finding the middle way doesn't mean compromising, but being smart. Dogmas get you stuck. Integration is about seeing the whole picture, not the one you believe to be true. Challenge your beliefs continually - that's how you get to find the truth.